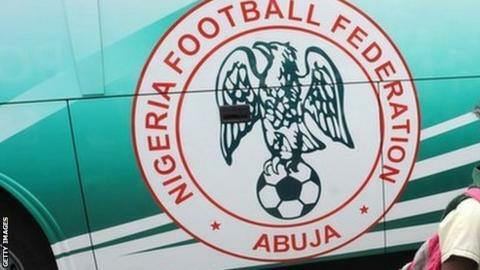 Nigeria are risking a ban by Fifa after Chris Giwa failed to step down as president of the football federation by Monday's deadline. A suspension could affect Nigeria's 2015 Africa Cup of Nations qualifiers against Congo on 6 September, and South Africa four days later. Fifa has rejected the appointment of Giwa, which came at a controversial Nigerian Football Federation 'election' last week, which split the governing body. Football's world governing body said it does not recognise the executives' election, but added it "it appears the ministry of sports has". "Should there still be persons claiming to have been elected and occupying the NFF offices at midnight on Monday, 1 September 2014, we will bring the case to the appropriate Fifa body for sanctions, which may include the suspension of the NFF," said the Fifa statement on Friday. Fifa accepted the decision of the majority congress, at which 39 of its 44 members resolved at an ad hoc general assembly, for executive committee elections in Nigeria to take place on 4 September. The disputes within the NFF have already led to a Fifa intervention, international suspension and the enforced return - twice - of outgoing NFF president Aminu Maigari. However Giwa, has played down the Fifa threat. "We will present our position to Fifa by Monday morning and they will be convinced beyond any reasonable doubt that we adopted the correct statutes before organising the election," said Giwa. "We call on Nigerians not to panic. The NFF is not intimidated and we do not expect any sanction because we have done the appropriate thing. "There is absolutely nothing to fear. Fifa will receive the position of the Federation and will be convinced that elections have, indeed, taken place," Giwa added. The crisis caused by the purported election has meant league matches will not be played across the country as scheduled this weekend after referees, club managers and players announced a boycott until the situation is resolved. Football journalists in the country have called on Nigeria President Goodluck Jonathan to intervene. On Friday, the country's National Assembly - comprised of the Senate and the House of Representatives - summoned all parties in the NFF to a meeting to resolve the crisis plaguing Nigerian football. In addition to the deep divisions in the NFF, the Super Eagles are still without a permanent coach as Stephen Keshi's contract was not renewed after the World Cup. He has agreed only to take temporary charge of the team for their two forthcoming Nations Cup qualifiers, having grown impatient with negotiations over a new deal.